Kwazar Mercury Pro + Spray Bottles might be the best sprayers you ever use! These 17 oz. and 33 oz. trigger sprayers deliver twice the output per pump, trimming time and effort off every detail you do. Kwazar Mercury Pro + Spray Bottles are professional grade, adjustable, double-action sprayers suitable for any detailing job. Free Daytona Speed Master Wheel Brush! 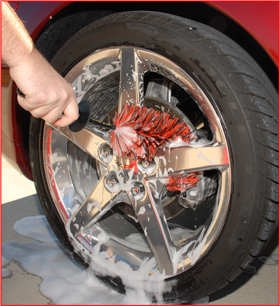 Right now at Autogeek, you can get a FREE Daytona Speed Master Wheel Brush with your purchase of $200 or more. The Daytona Speed Master Brush is valued at $29.99. 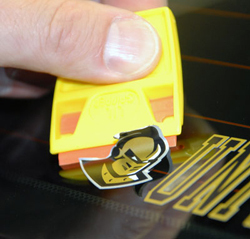 Use it to clean intricate wheel designs. The Daytona Speed Master Wheel Brush has flexible, soft bristles that safely loosen dirt and brake dust on any wheel finish. A flexible stem allows you to clean wheels front to back, between spokes, and even behind the caliper. Get your Free Daytona Speed Master Wheel Brush by adding it to your cart when you spend $200 at Autogeek.net. Offer ends this Sunday, July 25, 2010.